We believe that music has the power to illuminate and enhance the lives of children and families in a powerful way, and that the Kindermusik curriculum, in particular, can be the vehicle for bringing about such change. We believe that every child deserves the opportunity to know, enjoy and benefit from exposure to quality music in a positive, educational setting. The mission of MUSIC CONNECTIONS is to provide such quality music education to an increased number of children in the early childhood years, thereby enhancing their cognitive, physical, social, emotional, language and musical development. 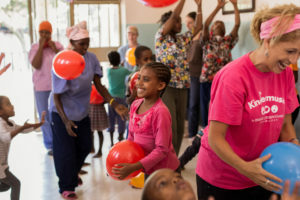 Music Connections seeks to increase and expand its programming to increase sponsorship of children and families with special needs and in low income situations who would otherwise not be able to afford Kindermusik. To further our Music Connections mission, we want to broaden our Kindermusik reach to include groups of special needs people whose lives can be so deeply touched through it but who, for one reason or another, have been unable to participate. To this end, we became a Not for Profit Foundation in 2008. To date, we have drastically increased our service to low-income families via individual Foundation Scholarships, to families of children with special needs, adopted children, at-risk two year olds, Autistic children, Hispanic families, Single Moms, and to Seniors. Partnerships with outside organizations have included MarcFirst/SPICE, Mid-Central Community Action/Neville House, Heritage Manor, Westminster Village, Western Avenue Community Center, Heartland Early Head Start, Evangelical Free Church, East White Oak Bible Church, Illinois State University’s Music Therapy Department, the Autism Society and CIDSO (Central Illinois Downs Syndrome Organization). In the summer of 2018, Music Connections embarked on its first International mission, partnering with seven licensed Kindermusik educators from around the country. 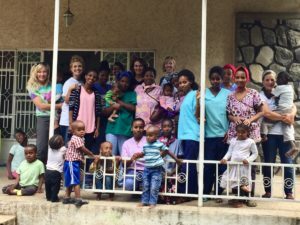 The team of 8 traveled to Ethiopia, where they spent a week at ESM Africa, bringing Kindermusik to orphanages and helping staff understand how to use music to enhance development of the children there in loving and joyful ways. The curriculum promotes language skills, symbolic thinking, coordination and social interaction. Because of the developmental approach, Kindermusik can be adapted for all children, including those who are developing at different rates. 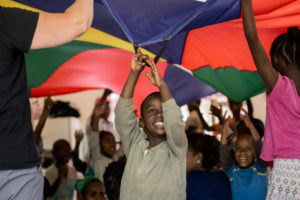 The structure of the curricula allows children to participate and develop at their own pace, making it appropriate for children with a variety of disabilities. 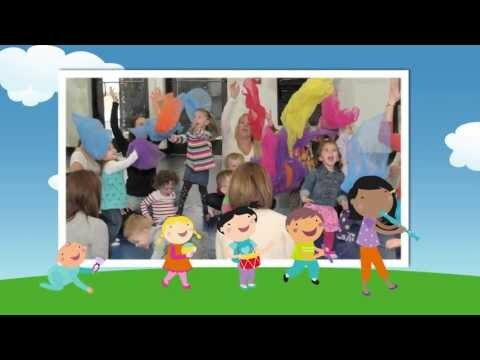 They further cite specific ways that Kindermusik can be successfully implemented with children with sensory problems, cognitive or developmentally delayed children such as the Downs Syndrome child, and children with motor disabilities such as cerebral palsy, spina bifida and other birth defects. In addition to welcoming and assisting families with special needs’ children at our core studio, MCF has partnered with SPICE (a division of MARCFIRST) to offer sessions of Kindermusik’s each year since the fall of 2007 to families, free of charge, who are being served through SPICE. 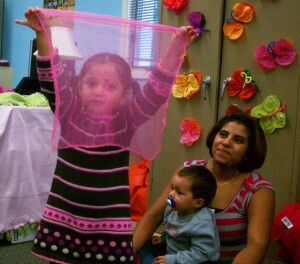 You’re never too young — or too old — to enjoy Kindermusik! Music and children are a powerful stimulus for the minds of seniors, who are always in need of this crucial interaction. Our Seniors Program brings the Kindermusik classroom into local senior centers and retirement communities. Parents and babies enjoy a unique, multi-generational class where they can foster valuable musical learning experiences while building personal relationships with loving and caring seniors. What happens when you add infants to the equation? Something even more incredible and beneficial for both. Since the fall of 2015, School year programming for seniors at Heritage Manor has been ongoing, and moms can volunteer to bring babies and toddlers, free of charge, to a five week fall or spring session. Plans are in the works to expand the program to other areawide senior centers. If you have connections with senior centers and/or organizations for children with disabilities, or personally know people in these areas who could benefit from the gift of Kindermusik, please email us. Ninos y Musica is a program offered in partnership with Western Avenue Community Center, and has been partially funded with a grant from Illinois Prairie Community Foundation — Mirza Arts Fund. This class is offered to members of the Hispanic Community in Bloomington-Normal with children birth – 5. Over two and a half years ago our family brought home our son, Elias, who was born in Ethiopia. He came to us scared and speaking Amharic, one of Ethiopia’s many languages. 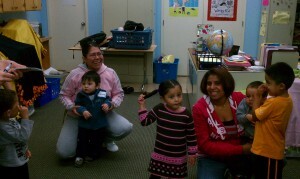 Since our older children had been Kindermusik kids, we enrolled Elias in Our Time. I knew Kindermusik would be something fun we could do together, but I had not anticipated how key Kindermusik would be in help us form a strong mother/child bond and in helping Elias develop English language skills. I also have the privilege of working at Western Avenue Community Center (WACC), a social service agency on Bloomington’s West Side that has served our community since 1929. One of the Center’s unique services is Hispanic Outreach, and WACC provides assistance for a growing population of low-income Hispanic families, many of which are struggling to learn English. As I was walking with Elias after Kindermusik one day, these two experiences merged in my brain, and I thought, “Wouldn’t it be powerful if Kindermusik and Western Avenue partnered to provide the Kindermusik experience to some of Western Avenue’s families?” I mentioned the idea in passing to Katie, and within a couple weeks we were sitting down with Amy Cottone, Director of Western Avenue, brainstorming the possibilities! I have been blessed to witness the amazing possibilities in store for these families, and thank you for supporting this effort by supporting Music Connections in their Foundation initiatives. One of our desires has always been to help young Moms in crisis to understand how the use of music can be a powerful, positive influencer, and to help them learn how to incorporate music, literature and movement to navigate times of stress and transition. To that end, Music Connections sought out a partnership with Mid-Central Community Action and, in the fall of 2016, offered its first “Family Music Night” class session at the Neville House, a shelter for victims of domestic abuse. To provide a basic need and further the ability to build rapport and relationship, MCF brings in a healthy, homemade meal for Moms and their children, followed by a 45 minute Kindermusik class. The session is once a week for six weeks. In November of 2016, MCF received the “Women to Women” grant from Illinois Prairie Community Foundation to subsidize this program.